This sauce was part of a recipe for grilled shrimp kabobs. I used it on a pound of shrimp that I sauteed on the stove. Combine all ingredients over medium heat. 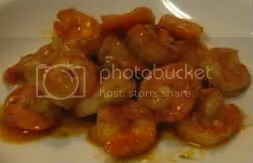 Toss desired amount with cooked shrimp.